Sitting in the central part of the United States and covering a large part of the Rocky Mountains and Colorado Plateau, Colorado is the eighth biggest state in America, covering an area of more than 104,000 square miles. It's also the 21st most populous state of all, with over 5.6 million people calling Colorado home. The state has borders with Utah, New Mexico, Kansas, Nebraska, Oklahoma, and Wyoming, as well as touching part of Arizona in its southwestern corner. Colorado is located in the Mountain Time Zone and is well-known for its huge range of landscapes, including mountains, plains, plateaus, canyons, forests, and more. Colorado was named after the Colorado River that runs through it, which was originally called the 'Rio Colorado' by Spanish settlers. Nicknamed the Centennial State, Colorado officially became a state 100 years after the Declaration of Independence was signed. It had been a territory since 1861, having been inhabited by Native Americans thousands of years prior to colonization. For a long time, the area was under Spanish control, but eventually became part of the United States. One of the most important geographical aspects of any location is its elevation, which is the term that denotes an area's position in relation to sea level. The elevation of Colorado is particularly special as it is the highest state of all, with a mean elevation of 6,800 feet (2,070 m). The second highest state is Wyoming, with a mean elevation 100 feet (30 m) lower than Colorado. Colorado is also known for having one of the largest elevation spans in the United States, with 11,123 feet (3,390 m) separating its highest and lowest points. The highest point in the state of Colorado is Mount Elbert, which is also the highest summit in the Rocky Mountains. Mount Elbert is located near the center of the state in the San Isabel National Forest. Named after a Colorado statesman named Samuel Elbert, Mt Elbert has an elevation of 14,440 feet (4,401.2 m) and is the second highest mountain in the contiguous United States after Mount Whitney in California. It’s a popular climbing location and is home to many plants and animals including black bears, marmots, mule deer, elk, and many different kinds of birds. The lowest point in the state of Colorado can be found at the Colorado-Kansas border. The Arikaree River runs through this area as part of its 156 mile route through the Great Plains region of North America. The Arikaree River is a tributary of the Republican River and is mostly located within Colorado. Near the border with Kansas, this river has an elevation of 3,317 feet (1,011 m). It was named after the Arikara Native Americans and has been given Natural Area status in the state of Colorado, playing home to many different birds, reptiles, fish, and amphibians. Another unique aspect of Colorado’s elevation is that this state is home to the highest incorporated town or city in the entire United States. 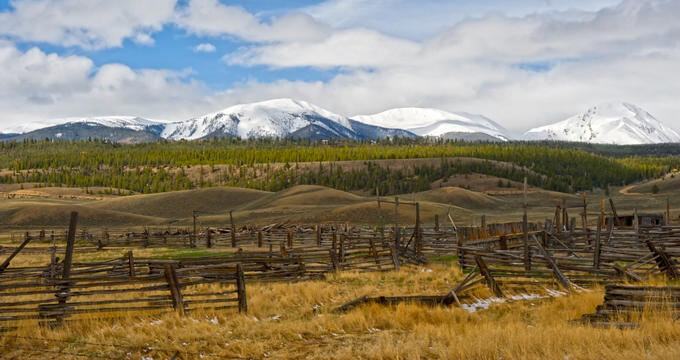 An old mining town named Leadville can be found in Lake County amidst the Rocky Mountains and has an elevation of 10,152 feet (3,094 m) which helped to earn it the nicknames of 'The Two Mile High City' and 'Cloud City'. The city has a small population of around 2,700 people but attracts many more as a prime tourist spot due to its unique mining history and status as the highest town in the nation. Due to the fact that the state of Colorado has a relatively high elevation in general, many of its major cities are also located at very high points, especially when compared to other big cities around the United States. The state capital of Denver, for example, has earned the nickname ‘Mile High City’ due to its elevation of 5,280 feet (1,609 m), which is approximately one mile. Other major cities around the state include Colorado Springs, which has an elevation of 6,033 feet (1,839 m) and Aurora, which has an elevation of 5472 feet (1,668 m). Due to its many mountainous areas, Colorado is also known for being one of the top skiing destinations in the United States and many of its ski resorts are famous all around the country and beyond. The elevation of these resorts is extremely high. Aspen, for example has an elevation of 8,000 feet (2,438 m), Vail stands at a height of 8,022 feet (2,445 m), Steamboat Springs has an elevation of 6,732 feet (2,052 m), and Telluride has an elevation of 8,750 feet (2,667 m).